Pineapple, sugar cane, citric acid, sulfur dioxide. May contain traces of SULPHITES. The Kingdom of the undisputed queen of the fruits is in Paraguay and southern Brazil. From there, they took up a long time ago the delicious triumph in the palates of the world, when Christopher Columbus got them supposedly handed over to Guadeloupe Indigenous in 1493 as a welcome gift. It was not until the 19th century they began slowly the pineapple plants to be shipped from the Caribbean to Europe, which made them much more affordable. Until that time, all generations grew up with the knowledge that the pineapple was something very special and precious. The Pineapple CUBE with their unusual shape also represents something very special. 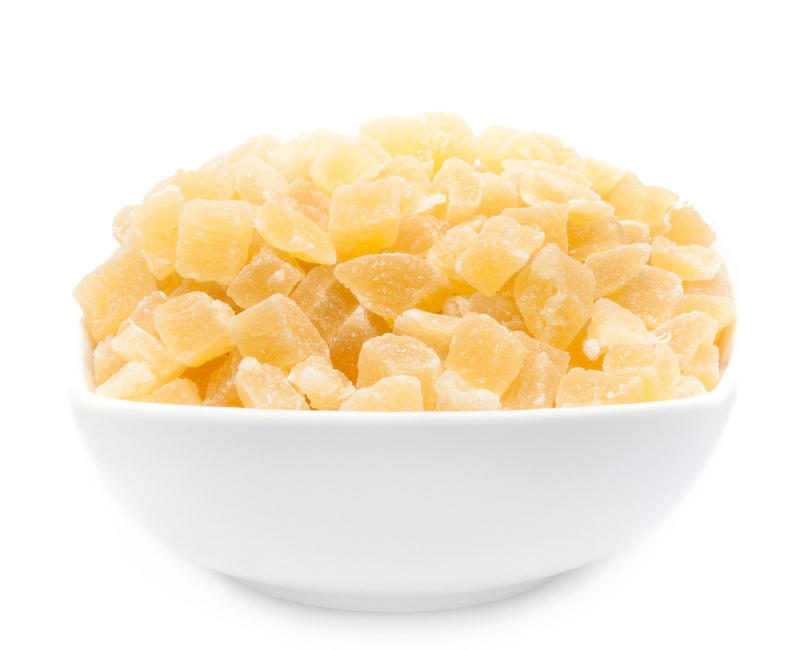 Gently dried pineapple, gently candied and something soft, this is a very fruity modern snack, which is just the essence of royal pineapple. Matur and quality Pineapples are easy to spot: they smell wonderfully fruity and are chock full of healthy vitamins, minerals and trace elements. All these features combine our royal Pineapple CUBE in modern style also in themselves. 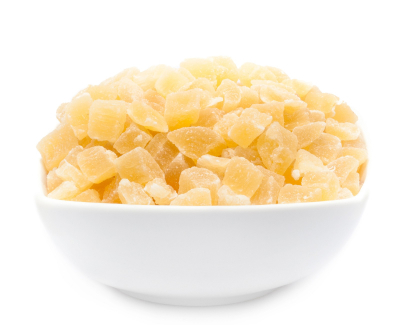 The fresh pineapple cubes are gently dried, and then crystallized with fine cane sugar, which her delicate yellow, perfectly flatters and accompanied with delicious taste. The taste is refreshing and typical for pineapple. With a modern twist, this great dice will also collect your taste buds to the peerage. If our delicious PINEAPPLE CUBE arrives on your tongue, you have already made a long journey around the world and experienced a lot. However, they have brought the fantastic sweet, slightly tart and typical pineapple aroma that it has predestined for the queen of the fruits. Versatile, these little cubes with its pastel yellow aura: they enjoy some in cereals, cook them into delicious muffins or cupcakes, mixing them into delicious pina colada's, scattering them on your Pizza Hawaii or in your curry sauce. Your creativity has no limits! Enjoy the exotic flair with gorgeous Pineapple CUBE!